Fresh from his big GOP primary win, conservative Patrick Morrisey is LEADING Democrat Sen. Joe Manchin in West Virginia’s hotly-contested Senate race. West Virginia is a critical battleground for Keeping the Senate. According to the poll, Attorney General Patrick Morrisey has the support of 46 percent of likely voters, while Democrat Sen. Joe Manchin has the support of 42 percent. Eleven percent are undecided. Most ominously for Manchin, he is well under the 50% threshold as an incumbent and faces a large number of undecided voters. (Undecided voters almost always break against the incumbent). Patrick Morrisey is a rock-solid conservative with a proven track record of leadership as West Virginia’s Attorney General. He is exactly the type of Senate conservative we need fighting for our values on the floor of the United States Senate. He deserves our FULL support. The Democrats know that the outcome of this seat will determine whether or not they take back the Senate. Patrick Morrisey has been one of the strongest voices in support of President Trump. He’s a rock-solid conservative who supports the President AND knows how to get things done in Washington. He’ll make a great Senator, but he needs our immediate help in a BIG WAY to win this November. Please do whatever you can. Even if you don’t live in West Virginia, the outcome of this Senate race will impact you. 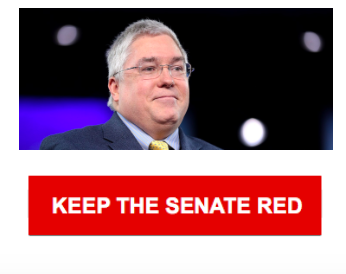 President Trump needs Patrick Morrisey’s conservative leadership in the Senate – to fight the Democrats and stand up to the rest of the Washington establishment.